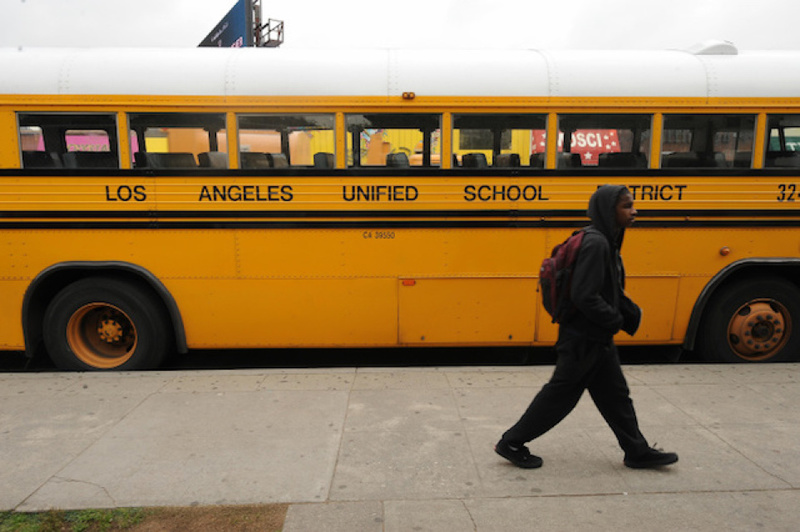 The LA Unified School District Is Rapidly Running Out Of Money. Wait, Check That — LAUSD Is Maybe Actually Flush With Extra Cash? Budgets are hard enough to read when everyone agrees what the numbers on the pages mean. But in L.A. Unified, two very different narratives have emerged about the $8.2 billion budget the district's school board approved Tuesday by a 6-1 vote. It matters who's right in this debate. In the short term, L.A. Unified officials are negotiating a new contract with their teachers. Teachers union leaders think the district will use pessimistic financial forecasts to wriggle out of paying for things teachers want in that contract, such as salary increases or lower class sizes. If contract talks don't yield progress this summer, the union has said they'll vote to authorize a strike this fall. But L.A. Unified officials say they're being realistic, not pessimistic. After all, they expect state funding to remain flat in the coming years. They also expect pension and benefits costs to rise and enrollment to drop. Watchdog groups and even some school board members — vice president Nick Melvoin in particular — are talking about insolvency as a real possibility for LAUSD. It's hard to reconcile these two narratives, but the livelihoods of LAUSD's 60,000 employees and the futures of 484,000 children are at stake here — so we're going to give it a try, in the name of helping everyone understand the district's new budget. We'll take it slow. And use lots of big pictures. And lots of small words. The topline: LAUSD has surpluses. They're shrinking. State law requires L.A. Unified officials to write a budget not just for this next school year, but for the next three years. L.A. Unified officials needed to change the trajectory of that line in order to submit a balanced budget for each of the next three years. So the budget approved on Tuesday calls for some cuts — including another round of cuts in the district's central offices. 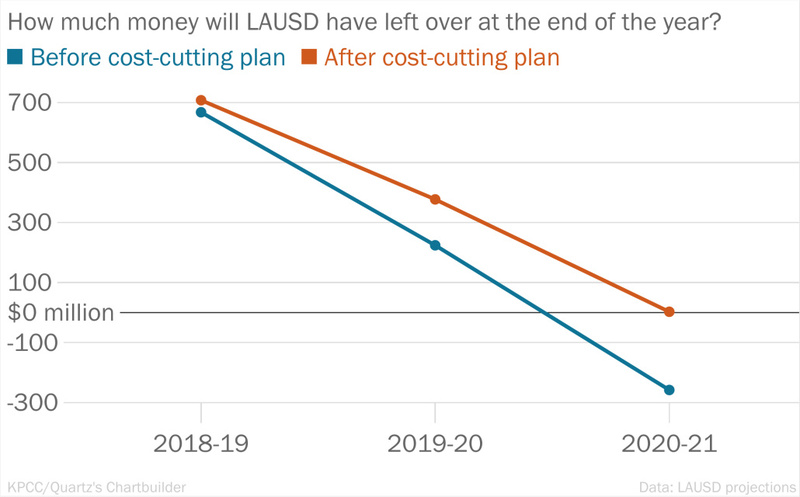 Overall, the cuts will be small in the context of LAUSD's massive budget — a cumulative savings of a modest $260 million (pocket change, right?). With those cuts, district officials bent the trajectory of the blue line; LAUSD now will end the 2020-21 school year with a little more than $2.7 million leftover, as the orange line shows. So if LAUSD can balance its budget through June 2021, why are some critics worried about insolvency? 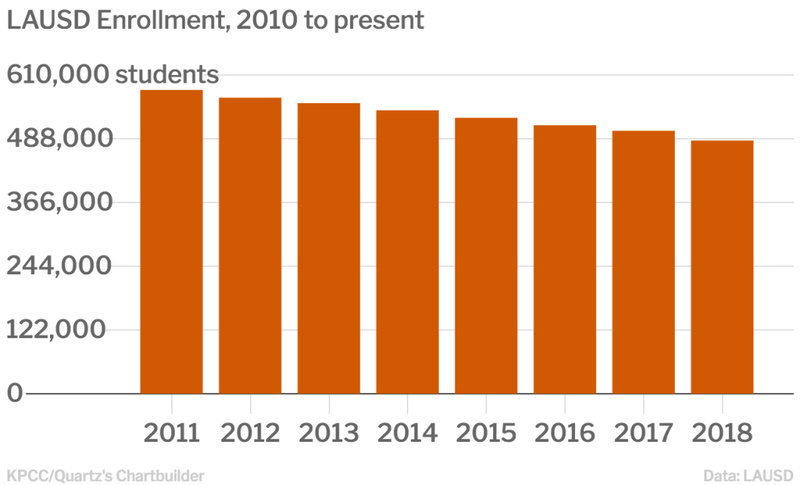 Despite this decline, the district's gotten bailed out by a few lucky breaks in recent years. State funding has been increasing. On top of that, state lawmakers have found ways to throw a few extra "one-time" dollars the district's way — extra dollars that help hold off more drastic cuts, LAUSD officials say. Still, L.A. Unified's Chief Financial Officer, Scott Price, says the district is spending around $500 million more per year than it is taking in. On top of that, district officials say they can no longer count on lucky breaks. In the future, district may be able to score one-time money here and there, but Gov. Jerry Brown and lawmakers have declared California's new school funding system "fully-funded" — so the steady string of increases in state funding may be over. Combine that with another whammy: the costs of employee health care and pensions are rising fast. "This is a real concern for us," Price said. "Those dollars ... crowd out things that we would like to do with our students as we look at achievement." Okay, but doesn't the district have a ton of money in reserve? Yes. It's one of the teachers union's big talking points, actually: "Even with $1.7 billion reserves," the union's website says, "LAUSD says it does not have the money" to pay for contract items the union wants. But it's not fair to say the district is hoarding huge stockpiles of cash it refuses to spend. 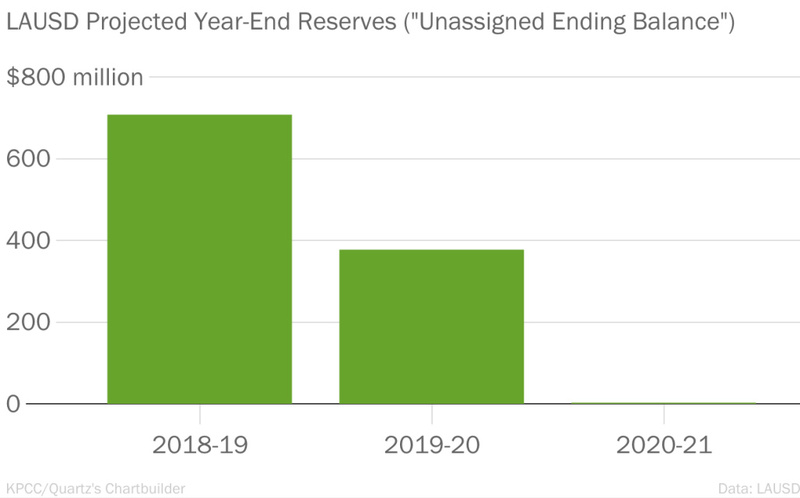 The district's true "reserve" is actually closer to $707 million right now — and over the next three years, LAUSD officials will burn through almost all of it. They'll have to burn through it; the district's budget wouldn't balance without it. So who's right about the district's financial future? Is the sky 'falling,' or are sunny skies ahead? In the end, that may be a matter of opinion. What's clearer: this budget will likely do little to settle the debate about the district's fiscal health — and those two divergent narratives are likely to persist. The teachers union is unlikely to take the district's claims of dwindling finances at face value. The district has projected deficits before — deficits that have never materialized. Plus, some budget watchdogs have long believed L.A. Unified over-budgets and under-spends. See: the books and supplies line. The newly-approved budget calls for more than $700 million in spending on books and supplies. But the district won't spend that much. If history is any indication, they'll spend around half that amount. On the other hand, for those who believe L.A. Unified's fiscal health is in trouble, this budget also includes a disappointment. L.A. Unified hasn't been setting aside enough money to pay for healthcare for district retirees — they'll cost the district more than $15 billion over the next 30 years. But on Tuesday night, as planned, the new budget zeroes out the annual payment they had been making to cover those future liabilities. Those who've advocated for another budget-balancing option — asking voters to raise their own property taxes to fund LAUSD — also came up empty on Tuesday. Board members weighed, but ultimately tabled, a proposal by George McKenna to place a sort of property tax hike called a parcel tax on the November ballot. They've promised to revisit the discussion next month, but time is running short if the board hopes to field a ballot measure in the fall. Just wading into this debate is L.A. Unified superintendent Austin Beutner, who noted on Tuesday that work on the budget was nearing completion by the time he took office in mid-May. Next year, Beutner will have the opportunity to put a clearer stamp on the budget and, he said Tuesday, "in the most simple terms, it has to look different than this budget." "The district is facing hard choices that it must address," Beutner's statement said. "More must be done to help students most in need reach their full potential. At the same time, a structural budget deficit threatens the District's long-term financial viability." "We have to hold both of those thoughts in our head," he continued, "because we have to do more for students most in need."